So let’s get right into it. I was lucky enough to be sent a few of her wonderful products to review. 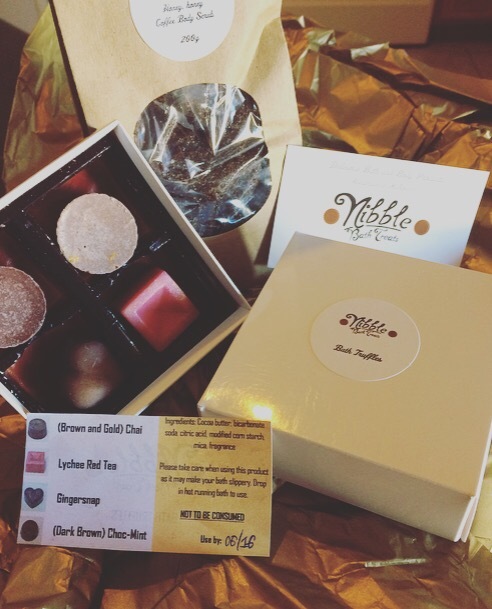 A box of bath truffles that are modeled after a little box of edible chocolate truffles (too cute I almost couldn’t let them melt away ☹️) and also a bag of the most intoxicating honey coffee body scrub I have ever smelt 💕🍯 But since the bath truffles are bath melts, there isn’t much for me to show you except for what they looked like before they melted & also what they felt like to bathe in. So expect only pictures of the products before use! 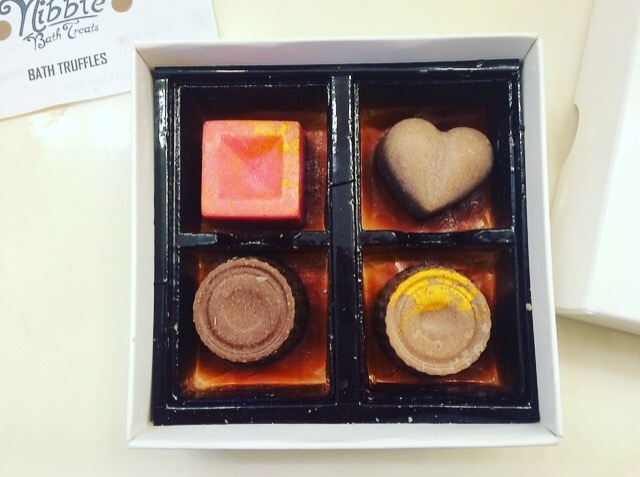 Let’s start with my box of truffles. $8.08 USD 🍭🍪🍫🍬 You simply place them in running warm water and let them soak and melt into your tub! Making it an aroma-therapy type of bath ❤️ The base ingredient in these little guys is cocoa butter, so they are going to leave your skin feeling extra soft and silky smooth after bathing in them! This one in particular was really impressively made. She was able to really pull of the delicate lychee red tea scent that a tea love like me can respect, it is kind of a florally fruity sweet smell with that signature tea leaf undertone. Overall very refreshing and easy on the nose, not too over bearing. The experience was similar to being a teabag steeping in my own pot of tea… 🌸🍵🌸 Such a lovely experience, my favorite out of the group! 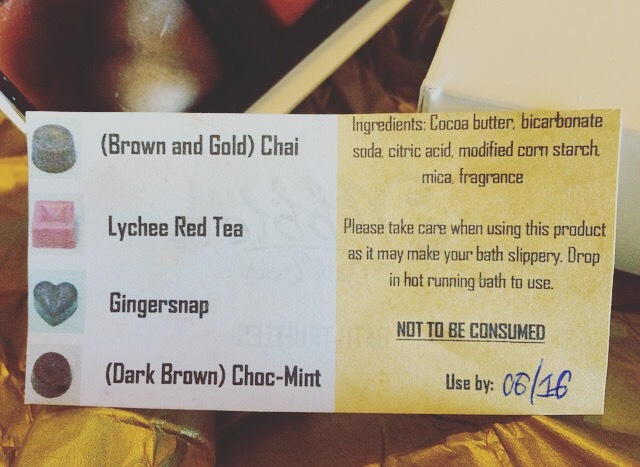 How exciting it was to read this little flavor indicator card and see the word “chai!” 💖 I am a huge chai fan. I drink it religiously, and it is truly one of my favorites. I smell chai and instantly go into an aroma induced heavenly coma.. Picking up this little golden nugget, I could instantly start smelling that warm scent I love so much. If you do not know what Chai Tea smells like, it is a combination of spicy cinnamon or clove with a hint of sweetness like vanilla- but also has some really unique qualities I can’t describe in words. Your sinuses will describe everything for you ❤️ This was another favorite of mine. It has that unmistakable scent any tea lover would go crazy about, and it really had me wanting to stay in the tub for as long as I could. This one is super exciting to describe for me. This tiny little light chocolate heart smells as if you just cracked open a tin stuffed full of your grandma’s fresh ginger cookies.. While they are still nice and warm… On christmas morning… In your PJ’s 😍 Wow, it really gives off that amazing warmth from the ginger and also those lovely spicy notes that will have you swearing it’s Dec. 25th! An amazing experience! Are any of you girls a fan of mint chip ice cream, mint patty cookies or those little junior mints? 🍪🌿 Me too! 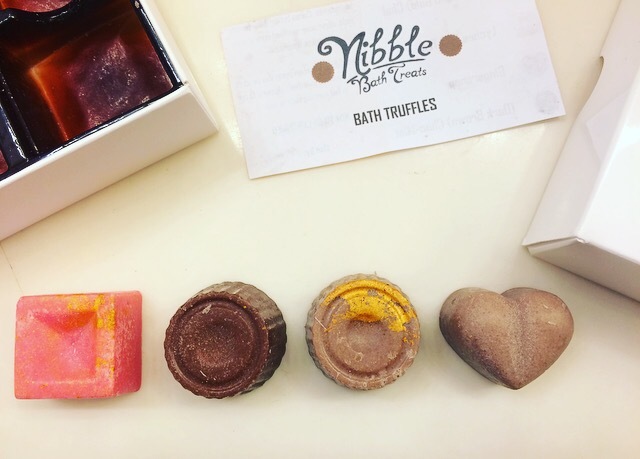 This bath truffle is made for girls like us. 💕 It has that refreshing cool minty burst combined with the luxuriously sweet, silky chocolate smell we love! Mint & chocolate go hand in hand. The best part about these truffles is that they smell so natural, not artificial or overbearingly sweet at all. The tea scented ones smell like true refreshing & light tea leaves, the gingersnap smells like spicy warm ginger, the mint smells like cool mint leaf. It’s wonderful. A lot of thought was put into these little boxes of heaven❤️ You simply must try a box out for yourself! This stuff just about had me licking the package before I could get it open. 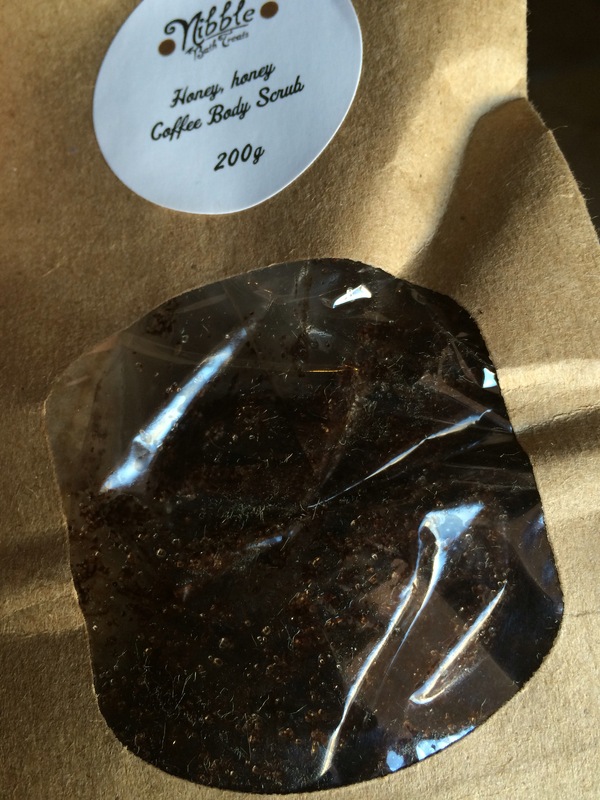 This is “Honey, Honey Coffee Body Scrub.” $11.38 USD 200 g’s. Honey & Coffee both are wonderful, beneficial sources packed with real good stuff for your skins health. Researchers found that topically applied caffeine (coffee grounds) helped protect against some skin cancers at the molecular level by inhibiting a protein enzyme in the skin. Not to mention it exfoliates away dead skin & leaves your skin glowing and healthy! It also firms skins and reduces the look of cellulite. Honey is also beneficial, it is packed with antioxidants and it is a natural humectant, meaning it draws moisture from the air into the skin and ensures it’s retained it in the layers where it’s needed most for penetrating, long-lasting hydration. Aka, the combination of the two together is magical! At Least that’s what your skin thinks! Not to mention these are all very simply made, made fresh, with expiration dates & with love. I love that about this brand. I love the fresh feel to everything, the natural scents and my velvety smooth skin after using her cutesy bath truffles & luxe body scrub! She is an extremely talented, creative young woman and you all should definitely see for yourselves. I will list her links at the bottom of the page. Trust me ladies at this price, you really can’t beat it. 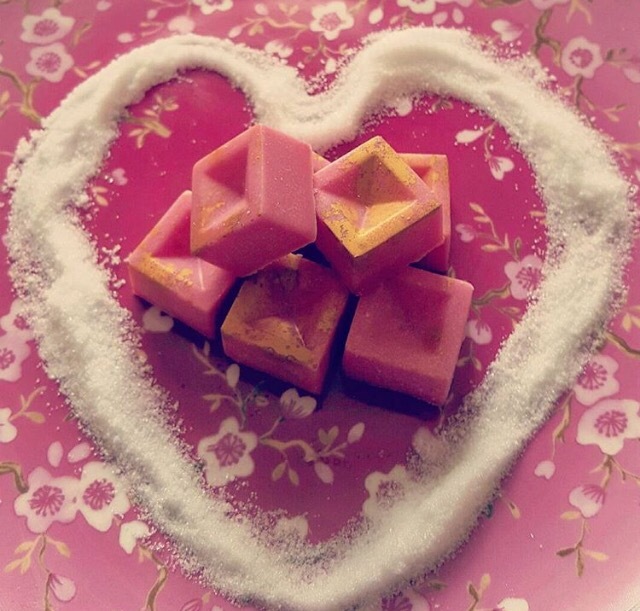 4 different bath truffles, 4 different pampered occasions for less than $10.00 USD. I also personally think this is the future of Valentines Day right here. I would die, if my man bought my a box of chocolate bath truffles instead of actual truffles, with a bag of honey scented body scrub! 🌹❤️ Or even for daughters and girlfriends on birthdays, holidays, celebratory events, baby showers etc! This would just be a super cute gift for someone.